I have been empathically connected to animals all my life. I can understand how they hurt, what they fear and what makes them happy. I have been instinctively helping animals using communication and touch since before I knew what Reiki was. Animals are beings expanding their consciousness and spirituality just as humans are. Healing animals is important as it helps not only the animal, but humans as well. Offering Reiki to an animal is different than giving Reiki to a person. I would like to address some of the ways I have found to help animals most effectively. 1. Be calm and relaxed when approaching an animal. Animals can easily sense our state of mind. When there is fear or upset in you, the same is created in the animal. A frightened animal is less likely to accept Reiki, and may lash out. Conversely, a state of peace and calm will soothe the animal, allowing it to more readily accept Reiki. I recommend meditating near the animal with the intent to allow Reiki to flow. 2. Animals are much more sensitive to energy than humans. Because of this, hands-on Reiki can seem like too much for them, particularly at the beginning. Always open your hands gently, at your sides or in your lap. Allow Reiki to flow from this position. This will help the animal feel more at ease with you. 3. Ask for permission to send Reiki. Animals like to feel that they are able to have some control over their lives, just as we do. Let them know that you are there to help. Tell them that you will listen to them as they guide how the Reiki session will go. If the animal is accepting, they will let you know by remaining nearby. They may become very still and may relax and go to sleep within a short period. Some animals need to continue moving around during Reiki, but they will stay nearby if they are interested in receiving. Use your intuition to guide you. 4. Let the animal guide your hands. If hands-on Reiki is something the animal feels they want, then they will move to your hands. Often they will place the body part they want treated into or near your hands. The animal knows better than anyone else where the Reiki will most help. Follow their lead. Never place your hands on an animal unless they have let you know they want you to. Just like with people, each one is different and sessions will vary, even with the same patient. Don’t assume the animal wants hands-on, even if it did before. 5. Follow the animal’s lead. When the animal lets you know he is done receiving Reiki, respect that, even if it’s only been a few minutes. End the session and thank the animal for participating. Each animal will let you know in their own way when they are done with the session. They may simply leave, or become engaged in another activity; they may wake from their “Reiki nap” and sniff your hands. If they decide to receive hands-on Reiki, don’t change hand positions if it seems that you may disturb the animal’s relaxed state. Let the animal guide the session. 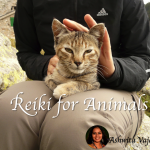 Both pets and wildlife enjoy Reiki and benefit from it. I often stand outside in a quiet wooded area and open my hands, offering Reiki to any that wish to receive it. The response is always amazing! Animals come out of nowhere to soak up the Reiki. Many of them stand within a few feet away and quite often fall asleep right in front of me. Birds, mammals, frogs, fish and insects such as dragonflies and butterflies have all come to close to me to receive Reiki. 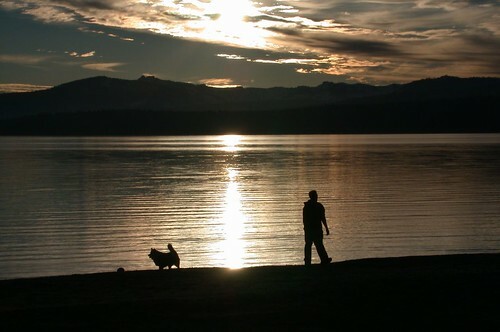 Healing animals contributes to healing the wounds humans have caused them over the millennia. Healing any creature heals us all. We are all one. Letting your intuition guide you is the best thing to do, I think. It sounds like you gave the terrace dog a wonderful blessing! Bless you. That sounded beautiful Auroraeyes !! yes using intuition is the best..I do also..My little dog has been attuned by me..so he is a little Reiki 1 guy..He was extremely ill last year so I asked AARaphael to come live with us..and sure enough..the vet even bandaged him in emerald green..Joey my dog has a good friend in Reiki and the Archangel!! Your dog is lucky also to have you right across the street!! Love it!!. Great article Angie..thank you for letting the animals shine!! I’m glad you enjoyed the article, Lhynn! Blessings to you and Joey. great article! i practice reiki mostly on dogs, rescue dogs. i read kathleen prasad’s book ‘reiki for dogs’ and she said follow the animals lead as well. and also just ‘be’ with the reiki and dog. it doesn’t matter who is the giver and who is the receiver. i thought that very interesting and gave me a new perspective when giving dogs reiki. I had a dog who is 15 years old and recently became more and more difficulty in standing up with her both hip joints. I offered her reiki but she just walked away. Your sharing helped me a lot and I now have more confidence. Thank you! I am very new at Reiki too. I learned in my class that I can do the symbols either clockwise or counterclockwise … counterclockwise being heavenly (spiritual) energy, clockwise being earth (grounding) energy. When I first tried Reiki on my dog because he was very tense (hands on, before I read this article), he didn’t calm down. Then I changed to the earth energy symbol and he calmed down. I’m wondering if an animal is more likely to respond to earth energy than spiritual energy, as they are very earth-oriented (and we are spiritual beings)? Kelly, That’s a great question! It actually helped me figure something out, I have noticed in my own use with animals that they often don’t like when the symbols are used. They seem to run away, cry out or even snap at me when I use the symbols. I have been curious about this and have mostly stopped using them with animals. I think there may be something to using them backwards and I will give that a try. Thank you for the question. Also, there is nothing wrong with using Reiki hands on with an animal as long as they are OK with that. My own cat loves to have hands on Reiki and many animals do. The most important thing is to make sure you check to see how they feel about it each time to be sure they want it hands on. Some are more sensitive and really prefer hands off Reiki or prefer it that way sometimes or at the beginning of a treatment until they settle in. Hi Jacqueline, I’m so happy to hear that your Jon is doing better after starting to receive Reiki! My cat prefers no symbols at all, though I have tried using the Cho Ku Rei backwards and she received that better. Her preference still seems to be no symbols at all. I wish you all the best with your kitty! Blessings. Thank you for the advise, I’ve noticed that birds often come to me when I sit in the park as I do Reiki on myself. They also fly into my hand when asked to or across tables in an open cafe straight into my hand. Now I know its the Reiki flowing. Thank you again. Hi Tamra. Most animals are very grounded so this is not a typical problem, but it can happen with domesticated dogs at times. Smaller dogs in particular seem to have a slightly higher tendency to display behaviors that would seem to indicate ungrounded energy. When you treat him with Reiki, make sure your direct the energy primarily at his feet and lower spine, especially at the start of the session. That may help to balance his energy. Also, time outdoors in a quiet setting may help. Flower essences (not essential oils) are very helpful with animals, too. In particular, try Bach Rescue Remedy as a great way to bring overall balance to his energy and ground him. Place 4 drops in his water or massage 4 drops down his spine. Flower essences have no risk of side effects and can be used with any medications. Thank you so much for this article. I am a Reiki master and am trying to find information on animal Reiki. Specifically using Reiki to help certain behaviors. I’ve heard that if a dogs ears have been clipped or other things that it dirupts their Chakras and can be helped with Reiki. If you know of any great books or articles I would greatly appreciate your or anyone elses recomendations. Thank you again for such a great article. I was asked to do some reiki on a 17yr old Alsatian last week. She was lovely but it was hard to keep from welling up knowing she doesn’t have long. She is a beautiful soul and the lady said she was much improved the next day. Previous post: Stop Negative Self Talk with Reiki, and Start Your Day Off Right!